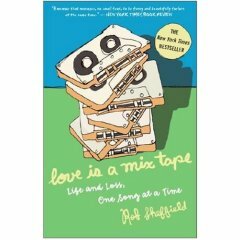 A friend of mine, who knows how much I enjoy making mix CDs, lent me Love is a Mix Tape: Life and Loss, One Song at a Time, a memoir by Rob Sheffield, who’s a contributing editor for Rolling Stone. The book is structured as a series of vignettes, each framed by a mix tape from the time of the events. I have built my life around loving music, and I surround myself with it. I’m always racing to catch up on my new favorite song. But I never stop playing my mixes. Every fan makes them. The times you lived through, the people you shared those times with—nothing brings it all to life like an old mix tape. It does a better job of storing up memories than actual brain tissue can do. Every mix tape tells a story. Put them together, and they add up to the story of a life. While Sheffield does reach back to his childhood, most of the book centres around his relationship with his wife Renée, her untimely death, and the reality of living as a young widower. Sheffield’s personal narrative is poignant and well-told, and he paints a touching portrait of his deceased wife. I occasionally found the prose to be (in the words of Julien Temple and David Bowie) a little clever-clever, but it was nevertheless an enjoyable and touching read. Update [January 27, 2008]: By strange coincidence, Rob Sheffield is about to visit the Boston area. He’ll be reading from this book at Brookline Booksmith on Wednesday, January 30th, 2008. Specifically, on the rise of sequencing and sampling in the early 80s, the democratization of music production that was enabled by the use of inexpensive equipment like the TB-303 and TR-808 and the ability to ‘test-drive’ music on the dance floor before committing it to vinyl, and the resultant development of the Chicago House sound. Hans T. Zeiner-Henrikson, a PhD candidate in the Department of Musicology at the University of Oslo, presented a paper on this work at a conference in Manchester. A copy of the paper, complete with QuickTime beat and music samples, is archived here. Damn. I wish my dissertation had drum breaks. 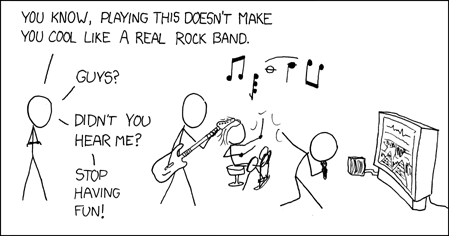 An excellent xkcd.com shoutout to Cambridge, MA game developers Harmonix, creators of Guitar Hero and Rock Band. Scroll down to the ‘bonus songs’ in Rock Band to see songs by Harmonix employee ‘side projects,’ local bands like Bang Camaro and Freezepop. Just released: The new Magnetic Fields album, Distortion, which Stephin Merritt describes as inspired by Jesus and Mary Chain‘s Psychocandy, ‘Just getting to a sound that’s raw and dirty and not inaudible takes a lot of work.’ Their two nights in Boston are sold out, unfortunately, at least at the moment (thank you, TicketBastard) but you might have better luck elsewhere. Also just out, British Sea Power‘s third album, Do You Like Rock Music? Hell yeah, especially if it’s the new BSP. Unfortunately, looks like they don’t have any East Coast tour dates yet, but I’m optimistic. And coming out next month: Heretic Pride, the gazillionth release by the Mountain Goats. They are hitting both high and low culture in Boston, playing at the Museum of Fine Arts and at the Middle East Downstairs on consecutive nights. 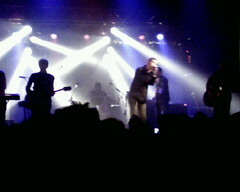 The National – how I love thee. 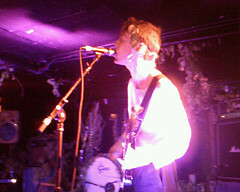 Their album Alligator, released at the end of 2005, may be the first CD that I’ve destroyed through overplaying (it hasn’t left my car for two years, and is now skipping uncontrollably), and they almost single-handedly elicited a trip to Chicago, where they played the 2006 Pitchfork Music Festival. Their 2007 followup, Boxer, with its gorgeously moody B&W photograph on the cover, matching the gorgeously moody music within, turned out to be worthy indeed, also going into permanent rotation and landing on a many a best–of–2007 list. But where The National really shone were in their live shows, which somehow manage to be compelling without being theatrical. I also love the way that the magnetic lead singer, Matt Berninger, can gracefully stand aside to let the musicians have the spotlight. I ended up seeing them four times, in three cities (and two countries!) in 2007, including two nights in a row at the Middle East, Cambridge, and they just keep getting better. 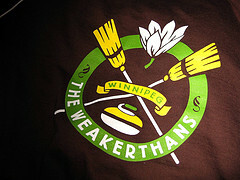 Image: Weakerthans track jacket. Photo by Flickr user the queen of subtle, reposted here under its Creative Commons license. You are currently browsing the zed equals zee blog archives for January, 2008.